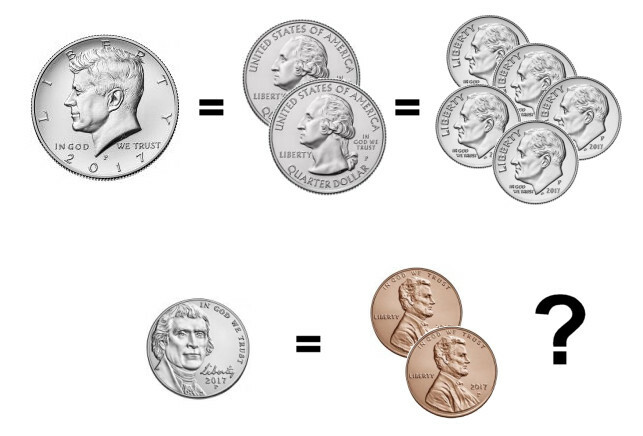 If a half dollar is the same as two quarters or five dimes, how can a nickel be equal to two pennies? Your response should be similarly coded. After the former web hosting company lost our database connection for a week(#%@! ), and then, during recovery had to fess up that they were not performing daily backups either, we have migrated to Web Hosting Hub. While it is early on, the new company has so far proven to be very responsive. The flurry of puzzles posted over the last many weeks were lost. The most recent puzzle will be reposted shortly, then back to irregular posting schedule again.